Due to constantly changing market conditions (new customer requirements, increasing volumes, changes in the machinery etc.) the production optimization can be seen as a moving target. Hence, it is vital to periodically reinitialize the process of problem analysis, solution finding, implementation, and target control to get the most out of your production. We want to ensure your long term success in using FACTORYMINER so your investment in our software is worthwhile year after year. 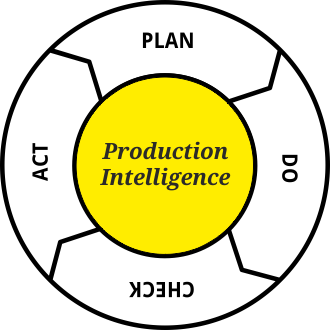 Within our Production Intelligence Consulting process we regularly discuss your specific production related challenges and problems. In the context of your current needs we then analyze the data collected with FACTORYMINER to uncover your problem sources and improvement potentials. Out of the possible solutions proposed by us you choose those best fitting your business needs. Subsequently we support you in tracking and monitoring your improvement projects with FACTORYMINER.